In this final 2018 edition of the Inclusive Growth Bulletin, we are glad to bring you a new issue of the Policy in Focus magazine, dedicated to child-sensitive social protection policies worldwide. In addition, we also share new entries in the IPC-IG's ongoing series of One Pagers focusing on non-contributory social protection programmes in countries of the Middle East and North Africa (MENA) region, and two new studies on smallholder farming, authored by our colleagues and partners at FAO. As we look forward to 2019, we would like to express our sincere gratitude for the ongoing support of partner institutions, international organisations, and our global network of thousands of collaborators, experts, policymakers and academics, as well as all the Centre's friends—including you, dear reader. 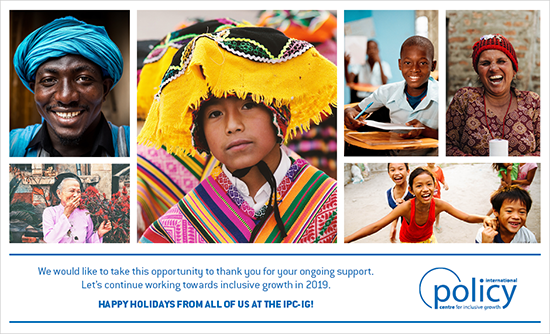 Happy Holidays from all of us at the IPC-IG! Children account for nearly half (50.2 per cent) of the world's extremely poor population, according to recent data by the World Bank and UNICEF. The impact of poverty on children has lifelong consequences, including poor health and nutrition and low educational performance. Social protection policies can play a crucial role in addressing the multifaceted nature of child poverty and its long-term pernicious effects, improving children’s overall well-being. Child-sensitive social protection is at the core of the new issue of the IPC-IG’s Policy in Focus magazine—Social Protection: meeting children's rights and needs. Specialist guest editors Anna Carolina Machado and Charlotte Bilo (IPC-IG) have gathered 15 inspiring articles penned by leading scholars, researchers and policy practitioners, with diverse perspectives on key challenges faced in the promotion of social protection programmes for children in Asia, Latin America, the Middle East and sub-Saharan Africa. Read more here. 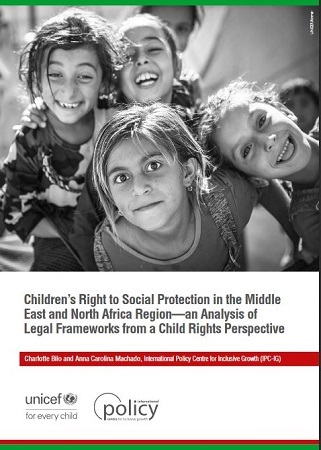 This month, we also bring you the Executive Summary of the report Children’s Right to Social Protection in the Middle East and North Africa Region—an Analysis of Legal Frameworks from a Child Rights Perspective, in Arabic, English (also in smartphone/tablet-friendly formats), French and Portuguese. This analysis was also composed by Machado and Bilo. It is the second in a series of four studies that have been developed as part of a partnership between the IPC-IG and the UNICEF MENARO. The series launched with an “Overview of non-contributory social protection programmes in the Middle East and North Africa (MENA) region though a child and equity lens.” The two forthcoming studies will discuss ways to increase fiscal space and resources for social protection for children and assess whether the existing systems in the region are equipped to continue providing protection when faced with shocks, such as conflicts or natural disasters. This month we bring you the final two One Pagers in a series featuring each of the 20 countries mapped in the launch study, featuring Yemen (in Arabic, English, French and Portuguese), and the United Arab Emirates (in Arabic, English, French and Portuguese). Previously-released One Pagers in this series include: Algeria; Bahrain; Djibouti; Egypt; Iran; Iraq; Jordan; Kuwait; Lebanon; Libya; Morocco; Oman; Palestine; Qatar; Saudi Arabia; Sudan; Syria; and Tunisia. Find all of them sorted by language: Arabic, English, French and Portuguese. For further critical articles featuring diverse perspectives on social protection in the MENA region, we suggest the reading of last December's issue of the Centre’s flagship publication, the Policy in Focus magazine, titled "Social Protection after the Arab Spring". It is available in Arabic, English and French. Our colleagues and partners at the socialprotection.org platform are working full-steam, and will host two new webinars early next year. On 15 January, the IPC-IG and UNICEF MENARO will organise the webinar "The role of zakat in the provision of social protection", part of a series featuring experts on social protection in MENA. Register here for free and please join the Social Protection in MENA Online Community if you are interested in following the most recent discussions on the topic. If you want to learn more about zakat, we suggest the Working Paper: "The role of zakat in the provision of social protection: a comparison between Jordan, Palestine and Sudan". It explains the relationship between zakat—one of the five pillars of Islam, which can be understood as a religious duty of those who are well-off to help those in need through financial or in-kind contributions—and social welfare. An accompanying One Pager is available in Arabic, English, and Portuguese. On 17 January, the Deutsche Gesellschaft für Internationale Zusammenarbeit (GIZ) is organising the webinar "Do Public Works Programmes work? Design and implementation features for programme success". Register here for free. IPC-IG Senior Project Officer Mariana Balboni joined the Global South-South Development Expo (GSSD Expo 2018), organised by the United Nations Office for South-South Cooperation, at the UN Headquarters, from 26 November to 1 December. During the event, she showcased the socialprotection.org platform as one of the initiatives supporting South-South Cooperation towards the achievement of the Sustainable Development Goals. 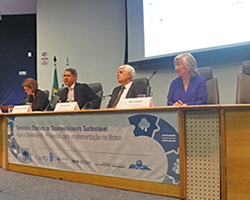 On 11 December, the IPC-IG, together with the Institute for Applied Economic Research (Ipea) and the Brazilian National Water Agency (ANA), organised the seminar "Sustainable Development Goals (SDGs)—Water and sanitation: proposals for implementation”, to present the main findings of the study “Water, Sanitation, and the SDG 6 in Brazil”, discussing how to improve the implementation and monitoring of Sustainable Development Goal (SDG) 6: “Ensure availability and sustainable management of water and sanitation for all” in Brazil. The event gathered various experts, public managers and representatives from the private sector, third sector organisations and civil society. The study is one of the main works on the SDG 6 at a global level, mainly because it is the first elaborated for a country such as Brazil, whose continental dimensions and complexities in the management of water and sanitation present unique challenges and opportunities. The study incorporated inputs and information from the Ministry of the Environment (MMA), the National Commission on the Sustainable Development Goals (CNODS) and ANA to inform initiatives, policies and programmes towards the implementation of SDG 6. This seminar was the third and last event promoted under the scope of "Project SDG6—Water and Sanitation: studies and propositions of measures for implementation and monitoring", a partnership between ANA, Ipea, the United Nations Development Programme (UNDP) and the IPC-IG. 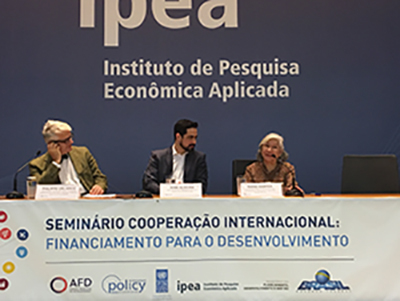 The IPC-IG, along with Ipea and the French Development Agency (AFD), organised the seminar: “International Cooperation: Financing for Development”, on 12 and 13 December in Brasilia. The purpose of the two-day seminar was to discuss the preliminary results of two studies conducted by Ipea, with the support from the AFD and the IPC-IG. The first study sought to identify, classify and qualify the flows of official development aid resources to Brazil, regarding projects that promote the sustainable development of the country. The second study analysed Brazilian concessional credit in light of international commitments undertaken by the country. Nearly 23 per cent of young Brazilians do not work or study, mostly women and low-income people, according to a study by Ipea, which had the operational support of the IPC-IG. This percentage is one of the largest in Latin America and the Caribbean. On the other hand, 49 per cent of young Brazilians only study or work, 13 per cent only work, and 15 per cent work and study. In Latin America and the Caribbean, 20 million young people do not work or study. This study is part of a regional survey entitled "Millennials in Latin America and the Caribbean: Working or Studying", which interviewed more than 15,000 young people from 15 to 24 years old, in nine Latin American and Caribbean countries with distinct economic and social contexts: Brazil, Chile, Colombia, El Salvador, Haiti, Mexico, Paraguay, Peru and Uruguay. The study was financed by the Inter-American Development Bank (IDB) and Canada’s International Development Research Centre (IDRC), and regionally coordinated by Chile’s Fundación Espacio Público. The year of 2018 was a great journey of work and accomplishments for the Centre. We would like to briefly recap our knowledge production and knowledge sharing endeavours, which together with capacity strengthening comprise the three foundational pillars of the IPC-IG’s work. During the year, the Centre undertook 24 projects in the areas of social protection, South–South learning, monitoring and evaluation, food and nutrition security, public policy design, and capacity-strengthening in Angola, Brazil, Egypt, Kenya, Mozambique, and the 20 countries in the Middle East and North Africa (MENA) region. 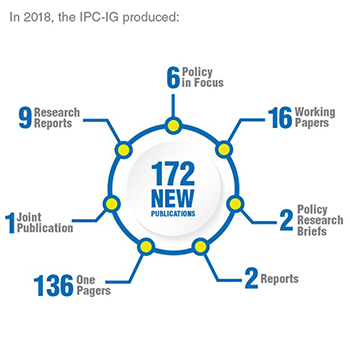 As you know, IPC-IG publications share newly produced and previously existing knowledge materials with a global audience, to improve international debate in the South-South arena. In 2018, the Centre produced 172 new publications, from topics including food and nutrition security, social protection and gender, education, and monitoring and evaluation. 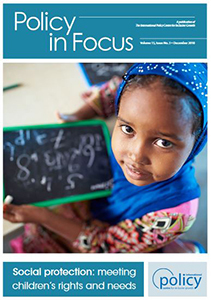 In addition to this month's special issue on social protection for children, Policy in Focus’s had two other new issues this year - "Women at work: addressing the gaps", and "Minimum wage: global challenges and perspectives" - and three translated issues. The next edition of Inclusive Growth Bulletin will be released in February 2019, gathering news and publications from the two first months of next year. See you then!